This time of the year is the jackfruit season, so if you live in a hotter area, your local grocery might carry them. Our local Meijer does though, or you can look for them at an oriental/international food store. Anyhow, jack fruit flesh, apart from eating raw can also be used to make soup, stew, salad or this no-churn jack fruit ice cream. You’ll see, jack fruit is ripen too quickly, so turning its flesh into ice cream is the perfect method to reserve its scent and freshness. 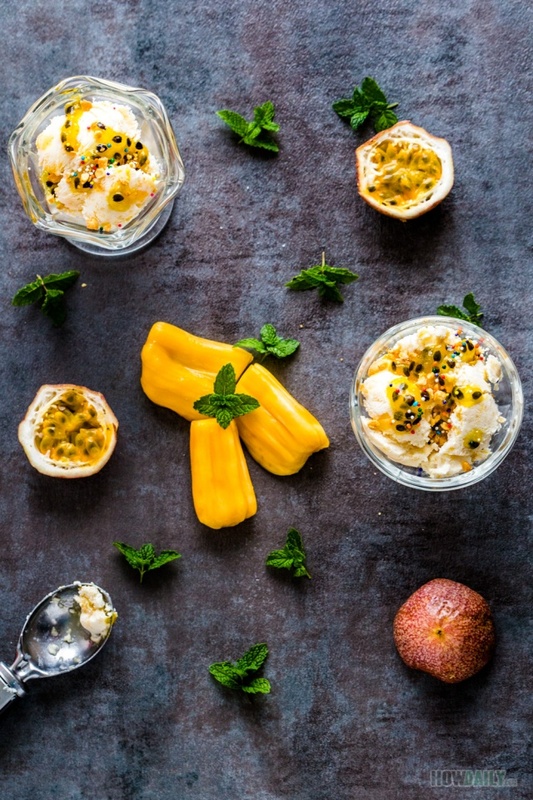 Adding in passion fruit syrup and you would have all the tropical flavor in a bowl. If passion fruit is not available in your area, chocolate or any sort of compote will do. You could also use popsicles molds to create cream popsicles instead to attract your kids even more. This recipe is using heavy cream, sweeten condensed milk and gelatin as thickening agents, that means no egg, no churn, no ice, salt or any special machine require. In fact, you don’t need a designate appliance to make ice cream, all you need are just your mixer, a blender (chopped by hand if you don’t have one), and a container/mold with lid. Just make sure to chill your container/mold beforehand for best result. 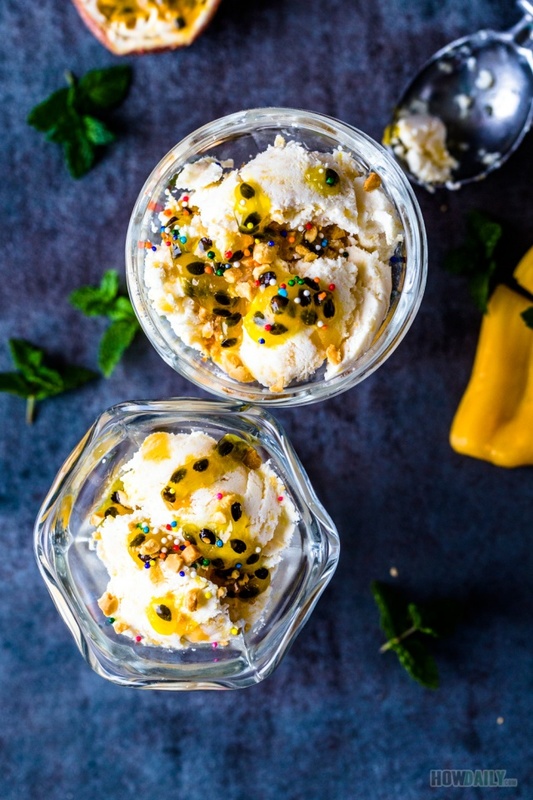 Enticing all your senses with this mesmerizing sweet & sour jackfruit ice cream with Greek yogurt. 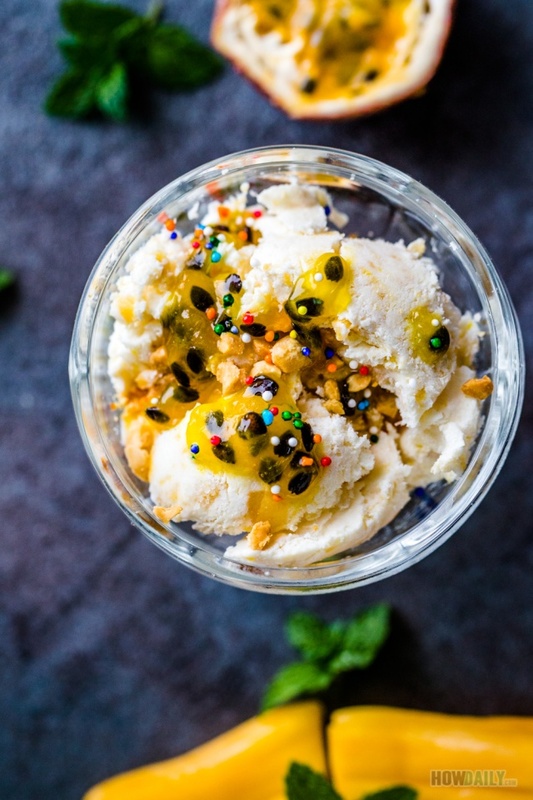 Top with some passion fruit syrup flavor for even more tropical feeling. Chill your ice cream container w/ lid or popsicle mold in freezer before hand or overnight for better result. Chill mixer bowl and beaters in freezer 10 minutes for easier beating. Add 1 tablespoon of water to gelatin powder in a microwave-able container, stir a bit and let sit for 5 minutes until soaked. While waiting, take 1/3 of jack fruit flesh and cut into small ½ cubes, set aside. Add remaining jack fruit flesh, condensed milk and Greek yogurt into a blender or food processor and process till mixed and somewhat smooth. Microwave the soaked gelatin powder for 10-15 second depend on yours wattage level. Stir the hot gelatin to dissolve and add to blender/processor and pulse a few times to mix evenly. Get the chilled bowl and beaters out, beat heavy cream till fully fluff. Now add all the jack fruit cubes and blended jack fruit-yogurt to mixing bowl. Fold to mix everything then transfer to pre-chilled container or popsicle molds. Let ice cream stay in freezer for 4-6 hours to fully set. (if prefer seedless) Strain passion fruits over a sieve, use back of spoon to press over seeds/pulps. Add passion fruit strained juice/pulp/content with 5 table spoon of water and sugar into small saucepan. Bring to boil while stirring to dissolve sugar then reduce heat to simmering. Simmering for 10 minutes or so before transfer to container. Drizzle over ice cream to bold up the flavor. 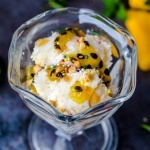 Ice cream: serve as is or take a scoop then drizzle some passion fruit syrup and a sprinkle of nuts. Popsicle: drizzle hot chocolate, caramel, syrup then top with some nuts, coconut flake, etc.